Looking to Grow Commercial Bamboo in Okeechobee? Moso Bamboo is one of the top growing commercial bamboo plants available. There is approximately a three-year growing period. The shoots and trunks from bamboo will begin to have diameters of 4 to 6 inches and reach heights of 45 – 60 feet. Investors and Farmers can reap benefits from commercial bamboo production as they plant fields in various locations. OnlyMoso was launched in Italy in 2014 and currently, OnlyMoso Italy has over 1,000 farmer partners and over 4,000 Acres of bamboo in the ground and has sold its’ entire shoot production for the next two years. OnlyMoso is committed to teaching the US agriculture community about the commercial benefits of a bamboo crop and the profitability of a bamboo farm. We provide bamboo plants for clients across the globe. 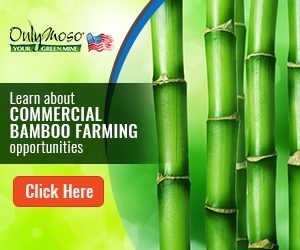 With the assistance of OnlyMoso USA, you can learn how to develop your own Commercial Bamboo Farm! We provide Commercial Bamboo Farming services to people in Okeechobee and surrounding areas (as well as worldwide). Interested in Growing Commerical Bamboo? Contact OnlyMoso today at (877)340-6755.